Out of more than 600 collegiate mock trial teams nationwide that began the season, a squad from Eastern Kentucky University finished 11th. 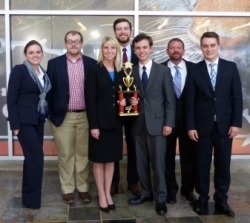 Competing in the American Mock Trial Association National Championship Tournament (NCT) in Cincinnati April 17-19, the EKU team finished with a 6-6 record against what Coach Tom Parker called "an extremely tough set of opponents." Eastern began by taking one of three ballots against the University of Arizona, which finished seventh; then swept all three ballots against Ivy League opponent Brown University in the second round. EKU then took two of three ballots from the University of Delaware, the 10th-place team, before losing three close ballots to the second-place finishers, the University of California at Berkeley, in the fourth round. Forty-eight teams competed in the NCT. EKU's National Championship Tournament appearance was its first since 2012, when it finished 14th. It was the University's highest finish in the event since 2009, when it placed fifth. This year's NCT squad was composed entirely of Kentucky residents. The team featured three seniors who competed on the 2012 NCT squad as freshmen – Josh Lang, a political science major from Fort Thomas; Caleb Taylor, a political science major from Union; and Anthony Sean Potter, a political science major from Whitesburg. They were joined on the squad by Allie Maples, a political science major from Mount Sterling; Angel Spurlock, a chemistry teaching major from Mount Vernon; Matt Boggs, a political science major from Whitesburg; Troy Cox, a retired Navy veteran and paralegal science major from Lexington; Omar Salinas Chacón, a double major in Spanish and political science from Louisville; and Mackenzie Despain, a homeland security major from Campbellsville. Lang, Maples, Spurlock, Boggs, and Salinas Chacón are all members of the EKU Honors Program. ​In addition to Parker, EKU faculty and staff working with the program include Lynnette Noblitt, Kristeena Johnson, Brandon Williams, and Sara Zeigler.